Tea is the drink of choice for millions of British people. It is estimated that a staggering 165 million cups of tea are drunk every day. There are a plethora of tea blends on the market, from the historically rich Assam and Earl Grey blends, to the more standard yet undoubtedly popular branded black teas found in supermarkets and food stores. The most common black tea drunk by Britons comes from the plant Camelia sinensis. Experts are eager to point out the health benefits of the common cup of tea - in particular the antioxidants that can help to fight illnesses such as cancer. Of course the herbal tea infusions should not be overlooked, as they too are cited as being hugely beneficial in terms of health and wellbeing. Chamomile, Peppermint and Ginger tea are just a drop in the ocean when it comes to healthy 'herbal' tea varieties, and the properties of each infusion can treat a multitude of common ailments. With this in mind, have you ever considered making your own tea? It might be much easier than you first imagined. You may opt for a cup of raspberry infused herbal tea purely because you like the taste. But many people also opt for different herbal teas because of their cleansing or health-giving properties. For some, both the taste and health assets of tea make it an attractive beverage of choice. Black tea - this is the most common type of tea drunk in Britain and used in English, Indian, Sri Lankan and Chinese tea blends. It is thought to be a good source of manganese and potassium. Manganese aids general body development as well as bone growth, whereas potassium is key to helping the body maintain the correct fluid levels. Chamomile - One of the more popular herbal teas, chamomile along with caraway, fennel and aniseed is well known for its calming properties. It is also great for helping to boost weakened immune systems, regulate digestion and relieve stomachache. Comfrey - Comfrey leaf from the plant Symphytum officinale is drunk to help stave off the symptoms associated with arthritis and rheumatism. Comfrey is also used as a means to settle and heal stomach and intestinal discomfort. Raspberry Leaf - Women who experience PMT (pre-menstrual tension) or those going through the menopause may drink raspberry leaf tea to help alleviate symptoms. Ginger - Ginger tea is renowned for its ability to calm nausea. Ginger tea can also help alleviate other abdominal problems as it helps to relax spasms in this area. A few slices or grates of ginger simmered gently in water are all that is needed to make this popular tea from scratch. Green - Green tea comes from the same plant as black tea, but is prepared in a different way, and drunk without milk or sugar. Green tea is widely touted as having cleansing qualities, with good levels of anti-oxidants that help to fight off cancer. Parsley - Another great cleansing tea that helps to flush out and aid normal kidney function for otherwise healthy people. Gargled, it is also a natural remedy for sore throats. Rooibos Tea - Rooibos also goes by the name of Redbush tea and is well known for its ability to help boost tired immune systems. It contains good levels of essential minerals such as manganese, zinc, potassium, iron and calcium. It also has calming properties that help alleviate ailments such as insomnia and headaches. Another benefit of Rooibos tea is its ability to stave off eczema. Hay fever and asthma sufferers may also drink this tea to help ease their conditions. , Parents may give their young children Redbush tea to ease the effects of colic. Rosehip - Rosehips are one of the most rich sources of vitamin C available. Extra vitamin C can help boost strained or weakened immune systems, for example during or after a cold. Peppermint - Peppermint tea is an excellent aid digestion that is drunk with or after a meal. Like Parsley, Peppermint tea can also be used to help treat a sore throat. Making your own tea infusions can be great fun, and enjoying the health benefits comes as an added bonus. Homemade tea blends can also make fantastic gifts for friends and family, and are very easy to make. The actual tea blend tends to be made from dried leaves, seeds or pods, although you can make some tea blends from freshly picked ingredients. Obviously you will need to collect either the fresh ingredients and dry them yourself, or buy ready dried mixes from a specialist tea blend shop (many of which can be found online). Having separate dried ingredients will allow you to experiment with your own tea blends. Fruits such as oranges and lemons can also be dried and added to your tea blends for a more exotic twist. To dry your own herbs and spices, keep them tied in small bunches upside down in a well-ventilated warm room. They need to be kept like this until they are crisp and bone dry, and then stored in an airtight jar. Black or Green tea from the Camelia sinensis plant must be picked when young and tender. For green tea, you will need to allow the leaves to sun dry for a few hours, before steaming them for a minute or so. They can then be dried (in the oven for 20 mins at 250F is fine) before storing. 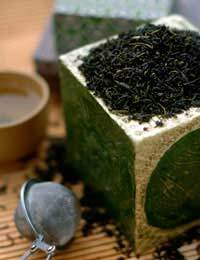 For black tea, again you will need the most young and tender leaves and leaf buds. You should then gently crush the leaves between your fingers until they turn a ruddy colour. They should then be left for a couple of days to air dry completely, before spreading on an oven tray and dried this way for 20 minutes. Again, the dried leaves need to be kept in an airtight container. When selecting your dried tea mixtures for use, it is best to crumble the dried mixture into a tea strainer or tea ball first, as mixing and crushing in metal or plastic bowls can affect the taste of the tea. Growing your own spice or herbal tea ingredients has many benefits. Firstly, you get to control how your ingredients are grown, employing organic growing methods to avoid the use of pesticides. It also means that you can have control over the quality of the leaves, pods, fruits or seeds picked as part of your own tea blends. For instance, if growing your own black or green tea from the plant Camelia sinensis, you can be sure that only the youngest and most tender of the tea leaves are picked. I would like to make and package my own earl grey tea. Am I able to buy the ingredients from you or do you know where from?